14 A None No Power Seat 14 A is a Premium Economy seat that has extra legroom. The tray table is in the armrest, making the armrest immovable and slightly reducing seat width. There is no floor storage for this seat during take-off and landing. 14 B None No Power Seat 14 B is a Premium Economy seat that has extra legroom. The tray table is in the armrest, making the armrest immovable and slightly reducing seat width. There is no floor storage for this seat during take-off and landing. 14 E None No Power Seat 14 E is a Premium Economy seat that has extra legroom. This is a bassinet location so passengers traveling with infants are often seated in this row. The tray table is in the armrest, making the armrest immovable and slightly reducing seat width. There is no floor storage for this seat during take-off and landing. 14 F None No Power Seat 14 F is a Premium Economy seat that has extra legroom. This is a bassinet location so passengers traveling with infants are often seated in this row. The tray table is in the armrest, making the armrest immovable and slightly reducing seat width. There is no floor storage for this seat during take-off and landing. 14 G None No Power Seat 14 G is a Premium Economy seat that has extra legroom. This is a bassinet location so passengers traveling with infants are often seated in this row. The tray table is in the armrest, making the armrest immovable and slightly reducing seat width. There is no floor storage for this seat during take-off and landing. 14 H None No Power Seat 14 H is a Premium Economy seat that has extra legroom. This is a bassinet location so passengers traveling with infants are often seated in this row. The tray table is in the armrest, making the armrest immovable and slightly reducing seat width. There is no floor storage for this seat during take-off and landing. 14 K None No Power Seat 14 K is a Premium Economy seat that has extra legroom. The tray table is in the armrest, making the armrest immovable and slightly reducing seat width. There is no floor storage for this seat during take-off and landing. 14 L None No Power Seat 14 L is a Premium Economy seat that has extra legroom. The tray table is in the armrest, making the armrest immovable and slightly reducing seat width. There is no floor storage for this seat during take-off and landing. 16 L None No Power Seat 16 L is a standard Premium Economy seat. 18 A None No Power Seat 18 A is an Economy seat that has extra legroom, however the position of the bassinet may be bothersome. The tray table is in the armrest, making the armrest immovable and slightly reducing seat width. There is no floor storage for this seat during take-off and landing. 18 B None No Power Seat 18 B is an Economy seat that has extra legroom, however the position of the bassinet may be bothersome. The tray table is in the armrest, making the armrest immovable and slightly reducing seat width. There is no floor storage for this seat during take-off and landing. 18 E None No Power Seat 18 E is an Economy seat that has extra legroom. The tray table is in the armrest, making the armrest immovable and slightly reducing seat width. There is no floor storage for this seat during take-off and landing. 18 F None No Power Seat 18 F is an Economy seat that has extra legroom. The tray table is in the armrest, making the armrest immovable and slightly reducing seat width. There is no floor storage for this seat during take-off and landing. 18 G None No Power Seat 18 G is an Economy seat that has extra legroom. The tray table is in the armrest, making the armrest immovable and slightly reducing seat width. There is no floor storage for this seat during take-off and landing. 18 H None No Power Seat 18 H is an Economy seat that has extra legroom. The tray table is in the armrest, making the armrest immovable and slightly reducing seat width. There is no floor storage for this seat during take-off and landing. 18 K None No Power Seat 18 K is an Economy seat that has extra legroom. The tray table is in the armrest, making the armrest immovable and slightly reducing seat width. There is no floor storage for this seat during take-off and landing. 18 L None No Power Seat 18 L is an Economy seat that has extra legroom. The tray table is in the armrest, making the armrest immovable and slightly reducing seat width. There is no floor storage for this seat during take-off and landing. 19 C None No Power Seat 19 C may have extra legroom. This seat has an immovable armrest. 19 J None No Power Seat 19 J may have extra legroom. This seat has an immovable armrest. 21 A None No Power Seat 21 A is an Economy Class seat with a misaligned window. 21 L None No Power Seat 21 L is an Economy Class seat with a misaligned window. 24 E None No Power Seat 24 E may have limited recline, and the proximity to the lavatory may be bothersome. This seat is in the last row of the section. 24 F None No Power Seat 24 F may have limited recline, and the proximity to the lavatory may be bothersome. This seat is in the last row of the section. 24 G None No Power Seat 24 G may have limited recline, and the proximity to the lavatory may be bothersome. This seat is in the last row of the section. 24 H None No Power Seat 24 H may have limited recline, and the proximity to the lavatory may be bothersome. This seat is in the last row of the section. 24 J None No Power Seat 24 J may have limited recline, and the proximity to the lavatory may be bothersome. This seat is in the last row of the section. 24 K None No Power Seat 24 K may have limited recline, and the proximity to the lavatory may be bothersome. This seat is in the last row of the section. 24 L None No Power Seat 24 L may have limited recline, and the proximity to the lavatory may be bothersome. This seat is in the last row of the section. 25 A None No Power Seat 25 A may have limited recline, and the proximity to the lavatory may be bothersome. This seat is in the last row of the section. 25 B None No Power Seat 25 B may have limited recline, and the proximity to the lavatory may be bothersome. This seat is in the last row of the section. 25 C None No Power Seat 25 C may have limited recline, and the proximity to the lavatory may be bothersome. This seat is in the last row of the section. 26 A None No Power Seat 26 A is an Economy seat. The tray table is in the armrest, making the armrest immovable and slightly reducing seat width. There is no floor storage for this seat during take-off and landing. This seat is missing a window. 26 B None No Power Seat 26 B is designated by Air France as a Preferred Seat. An extra surcharge must be paid to reserve this seat. This seat has extra legroom. The proximity to the lavatory may be bothersome. The tray table is in the armrest, making the armrest immovable and slightly reducing seat width. There is no floor storage for this seat during take-off and landing. 26 C None No Power Seat 26 C is designated by Air France as a Preferred Seat. An extra surcharge must be paid to reserve this seat. This seat has extra legroom. The proximity to the lavatory may be bothersome. The tray table is in the armrest, making the armrest immovable and slightly reducing seat width. There is no floor storage for this seat during take-off and landing. 26 E None No Power Seat 26 E is an Economy seat, however, the position of the bassinet and bulkhead may be bothersome. The tray table is in the armrest, making the armrest immovable and slightly reducing seat width. There is no floor storage for this seat during take-off and landing. 26 F None No Power Seat 26 F is an Economy seat, however, the position of the bassinet and bulkhead may be bothersome. The tray table is in the armrest, making the armrest immovable and slightly reducing seat width. There is no floor storage for this seat during take-off and landing. 26 G None No Power Seat 26 G is an Economy seat, however, the position of the bassinet and bulkhead may be bothersome. The tray table is in the armrest, making the armrest immovable and slightly reducing seat width. There is no floor storage for this seat during take-off and landing. 26 H None No Power Seat 26 H is an Economy seat, however, the position of the bassinet and bulkhead may be bothersome. The tray table is in the armrest, making the armrest immovable and slightly reducing seat width. There is no floor storage for this seat during take-off and landing. 26 J None No Power Seat 26 J is designated by Air France as a Preferred Seat. An extra surcharge must be paid to reserve this seat. This seat has extra legroom. The proximity to the lavatory may be bothersome. The tray table is in the armrest, making the armrest immovable and slightly reducing seat width. There is no floor storage for this seat during take-off and landing. 26 K None No Power Seat 26 K is designated by Air France as a Preferred Seat. An extra surcharge must be paid to reserve this seat. This seat has extra legroom. The proximity to the lavatory may be bothersome. The tray table is in the armrest, making the armrest immovable and slightly reducing seat width. There is no floor storage for this seat during take-off and landing. 26 L None No Power Seat 26 L is an Economy seat. The tray table is in the armrest, making the armrest immovable and slightly reducing seat width. There is no floor storage for this seat during take-off and landing. This seat is missing a window. 37 E None No Power Seat 37 E may have limited recline, and the proximity to the galley may be bothersome. This seat is in the last row of the section. 37 F None No Power Seat 37 F may have limited recline, and the proximity to the galley may be bothersome. This seat is in the last row of the section. 37 G None No Power Seat 37 G may have limited recline, and the proximity of the galley may be bothersome. This seat is in the last row of the section. 37 H None No Power Seat 37 H may have limited recline, and the proximity of the galley may be bothersome. This seat is in the last row of the section. 38 A None No Power Seat 38 A may have limited recline, and the proximity to the lavatory and galley may be bothersome. This seat is in the last row of the section. 38 B None No Power Seat 38 B may have limited recline, and the proximity to the lavatory and galley may be bothersome. This seat is in the last row of the section. 38 C None No Power Seat 38 C may have limited recline, and the proximity to the lavatory and galley may be bothersome. This seat is in the last row of the section. 38 J None No Power Seat 38 J is a standard Economy seat, however, the proximity to the galley may be bothersome. 39 K None No Power Seat 39 K may have limited recline, and the proximity to the galley may be bothersome. This seat is in the last row of the section. 39 L None No Power Seat 39 L may have limited recline, and the proximity to the galley may be bothersome. This seat is in the last row of the section. 4 B None No Power Seat 4 B is a Business seat, however the proximity to the galley may be bothersome. 4 E None No Power Seat 4 E is a Business seat, however the proximity to the galley may be bothersome. 4 G None No Power Seat 4 G is a Business seat, however, the proximity to the galley may be bothersome. 4 K None No Power Seat 4 K is a Business seat, however, the proximity to the galley may be bothersome. 4 L None No Power Seat 4 L is a Business seat, however, the proximity to the galley may be bothersome. 41 A None No Power Seat 41 A may have restricted legroom due to the protrusion of the exit door. The proximity to the lavatory may be bothersome. The tray table is in the armrest, making the armrest immovable and slightly reducing seat width. There is no floor storage for this seat during take-off and landing. 41 B None No Power Seat 41 B is designated by Air France as a Preferred Seat. An extra surcharge must be paid to reserve this seat. This seat has extra legroom. The proximity to the galley may be bothersome. The tray table is in the armrest, making the armrest immovable and slightly reducing seat width. There is no floor storage for this seat during take-off and landing. 41 C None No Power Seat 41 C is designated by Air France as a Preferred Seat. An extra surcharge must be paid to reserve this seat. This seat has extra legroom. The proximity to the galley may be bothersome. The tray table is in the armrest, making the armrest immovable and slightly reducing seat width. There is no floor storage for this seat during take-off and landing. 41 J None No Power Seat 41 J is designated by Air France as a Preferred Seat. An extra surcharge must be paid to reserve this seat. This seat has extra legroom. The proximity to the galley may be bothersome. The tray table is in the armrest, making the armrest immovable and slightly reducing seat width. There is no floor storage for this seat during take-off and landing. 41 K None No Power Seat 41 K is designated by Air France as a Preferred Seat. An extra surcharge must be paid to reserve this seat. This seat has extra legroom. The proximity to the galley may be bothersome. The tray table is in the armrest, making the armrest immovable and slightly reducing seat width. There is no floor storage for this seat during take-off and landing. 41 L None No Power Seat 41 L may have restricted legroom due to the protrusion of the exit door. The tray table is in the armrest, making the armrest immovable and slightly reducing seat width. There is no floor storage for this seat during take-off and landing. 43 E None No Power Seat 43 E is an Economy seat that has extra legroom, however, the position of the bassinet may be bothersome. The tray table is in the armrest, making the armrest immovable and slightly reducing seat width. There is no floor storage for this seat during take-off and landing. 43 F None No Power Seat 43 F is an Economy seat that has extra legroom, however, the position of the bassinet may be bothersome. The tray table is in the armrest, making the armrest immovable and slightly reducing seat width. There is no floor storage for this seat during take-off and landing. 43 G None No Power Seat 43 G is an Economy seat that has extra legroom, however, the position of the bassinet may be bothersome. The tray table is in the armrest, making the armrest immovable and slightly reducing seat width. There is no floor storage for this seat during take-off and landing. 43 H None No Power Seat 43 H is an Economy seat that has extra legroom, however, the position of the bassinet may be bothersome. The tray table is in the armrest, making the armrest immovable and slightly reducing seat width. There is no floor storage for this seat during take-off and landing. 49 C None No Power Seat 49 C is a standard Economy seat, however, other flyers tend to bump into this seat. 49 J None No Power Seat 49 J is a standard Economy seat, however, other flyers tend to bump into this seat. 5 A None No Power Seat 5 A is a Business seat, however, the position of the bassinet may be bothersome. 5 B None No Power Seat 5 B is a Business seat, however, the position of the bassinet may be bothersome. 5 E None No Power Seat 5 E is a Business seat, however, the position of the bassinet may be bothersome. 5 F None No Power Seat 5 F is a Business seat, however, the position of the bassinet may be bothersome. 5 G None No Power Seat 5 G is a Business seat, however, the position of the bassinet may be bothersome. 5 L None No Power Seat 5 L is a standard Business seat. 50 A None No Power Seat 50 A is a standard Economy seat. As one of the only twosomes in Economy Class, this seat is ideal when traveling with a partner. 50 B None No Power Seat 50 B is a standard Economy seat. As one of the only twosomes in Economy Class, this seat is ideal when traveling with a partner. 50 K None No Power Seat 50 K is a standard Economy seat. As one of the only twosomes in Economy Class, this seat is ideal when traveling with a partner. 50 L None No Power Seat 50 L is a standard Economy seat. As one of the only twosomes in Economy Class, this seat is ideal when traveling with a partner. 51 A None No Power Seat 51 A is a standard Economy seat. As one of the only twosomes in Economy Class, this seat is ideal when traveling with a partner. 51 B None No Power Seat 51 B is a standard Economy seat. As one of the only twosomes in Economy Class, this seat is ideal when traveling with a partner. 51 K None No Power Seat 51 K is a standard Economy seat. As one of the only twosomes in Economy Class, this seat is ideal when traveling with a partner. 51 L None No Power Seat 51 L is a standard Economy seat. As one of the only twosomes in Economy Class, this seat is ideal when traveling with a partner. 52 A None No Power Seat 52 A is a standard Economy seat. As one of the only twosomes in Economy Class, this seat is ideal when traveling with a partner. 52 B None No Power Seat 52 B is a standard Economy seat. As one of the only twosomes in Economy Class, this seat is ideal when traveling with a partner. 52 K None No Power Seat 52 K is a standard Economy seat. As one of the only twosomes in Economy Class, this seat is ideal when traveling with a partner. 52 L None No Power Seat 52 L is a standard Economy seat. As one of the only twosomes in Economy Class, this seat is ideal when traveling with a partner. 53 A None No Power Seat 53 A is a standard Economy seat. As one of the only twosomes in Economy Class, this seat is ideal when traveling with a partner. 53 B None No Power Seat 53 B is a standard Economy seat. As one of the only twosomes in Economy Class, this seat is ideal when traveling with a partner. 53 E None No Power Seat 53 E is in the last row. This seat may have limited recline. The proximity to the lavatory may be bothersome. 53 F None No Power Seat 53 F is in the last row. This seat may have limited recline. The proximity to the lavatory may be bothersome. 53 G None No Power Seat 53 G is in the last row. This seat may have limited recline. The proximity to the lavatory may be bothersome. 53 H None No Power Seat 53 H is in the last row. This seat may have limited recline. The proximity to the lavatory may be bothersome. 53 K None No Power Seat 53 K is in the last row. This seat may have limited recline. The proximity to the lavatory may be bothersome. As one of the only twosomes in Economy Class, this seat is ideal when traveling with a partner. 53 L None No Power Seat 53 L is in the last row. This seat may have limited recline. The proximity to the lavatory may be bothersome. As one of the only twosomes in Economy Class, this seat is ideal when traveling with a partner. 54 A None No Power Seat 54 A is in the last row. This seat may have limited recline. The proximity to the lavatory may be bothersome. As one of the only twosomes in Economy Class, this seat is ideal when traveling with a partner. 54 B None No Power Seat 54 B is in the last row. This seat may have limited recline. The proximity to the lavatory may be bothersome. As one of the only twosomes in Economy Class, this seat is ideal when traveling with a partner. 6 G None No Power Seat 6 G is a standard Business seat. 6 K None No Power Seat 6 K is a standard Business seat. 6 L None No Power Seat 6 L is a standard Business seat. All Business and Premium Economy seats have 110V power ports. There are outlets between the seats in Economy. 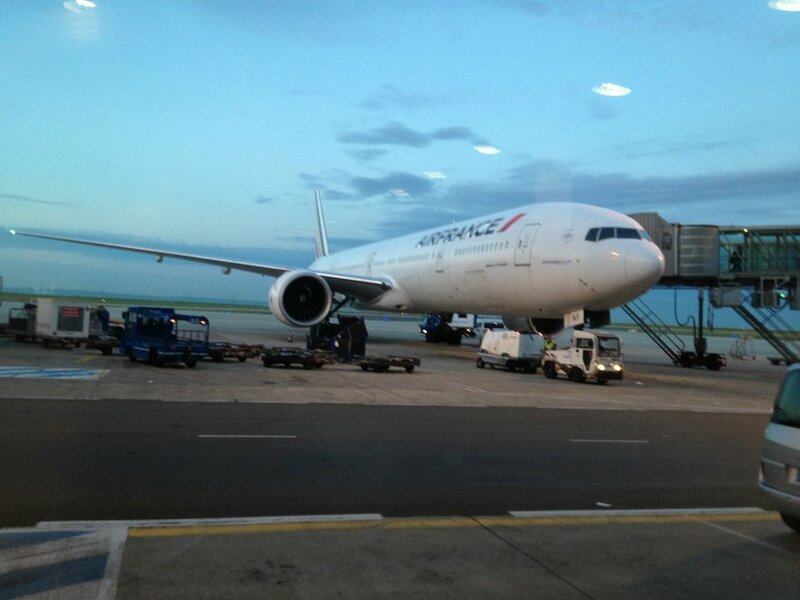 Air France operates this version of the Boeing 777-300ER configured with 381 seats in three classes of service. 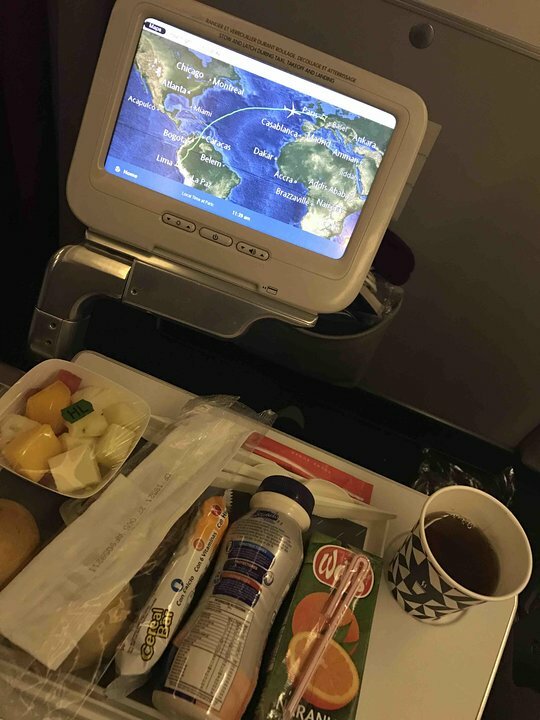 It is flown on various long-haul intercontinental routes. Onboard classes include Business, Premium Economy, and Economy. Aisles are narrow in the Economy Class cabin as Air France has 10 seats abreast. Window seats have an entertainment box beneath the seat ahead which limits storage and leg room. Seat seems narrower than the other. Good room for legs. 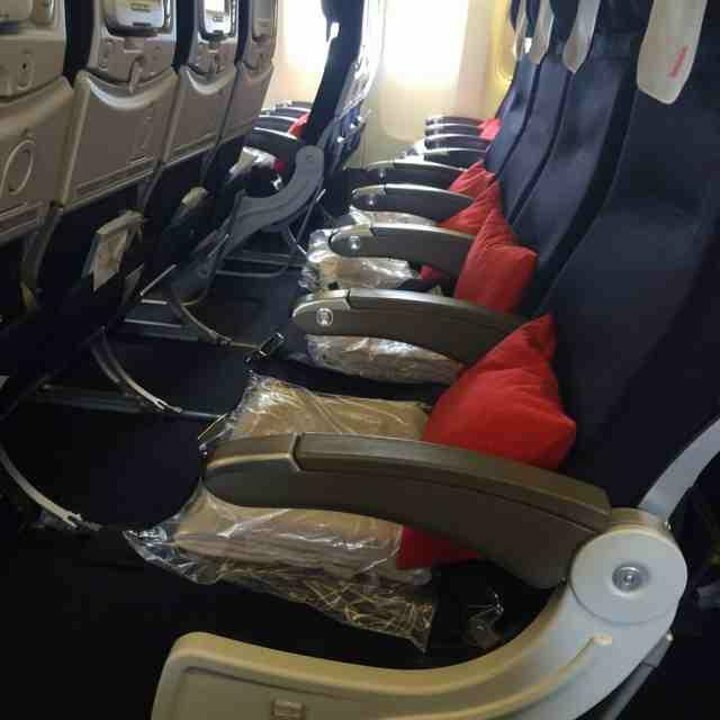 Typical economy seat for a 10 abreast 77W to Dakar. This means it is cramped and uncomfortable. Pitch is barely sufficient for my 186cm height. Additionally, this layout is the old one for Air France. My IFE screen froze on the flight, which wasn't much of an issue as the selection wasn't brilliant and I had my iPad loaded up. The IFE system and other cabin systems are from the early 2000's. 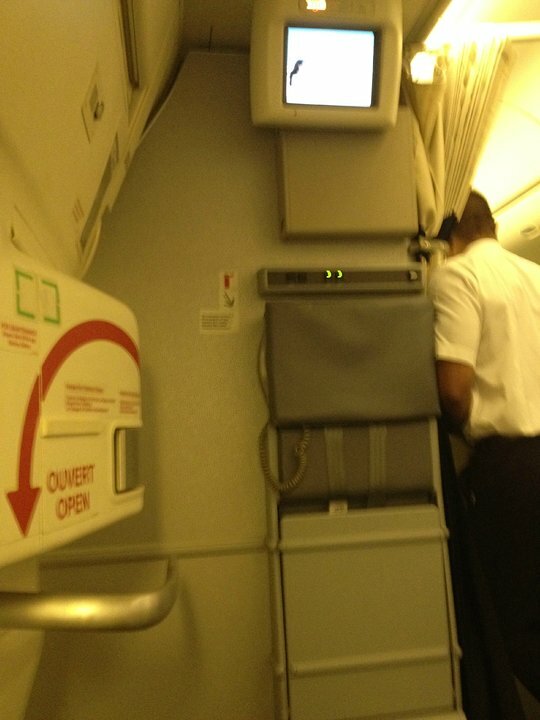 Apparently Air France is still working on upgrading cabins across their fleet. Seats 19A 19B 19H and 19J have misaligned video screen due to 2 seats in row 18. when you watch the screen, it's not directly in front of you. Never, never choose this seat. I actually paid extra for this at the airport and was assigned to this one - the seat is incredibly narrow (vice-like), no window, freezing cold because of the emergency door, and no space for your arms as the window-side wall curves inwards. The seat arms of row 49 can't be removed as on the other rows... So even though there was nobody on the two adjacent seats, I could not lie on the seats... very frustrating. For seven hours flight was pretty good. I paid a premium to have access to this seat with extra leg room. This seat is not so good, it's in the middle of kitchen + toilet so you always have people walking on your feet. The TV screen works not so good & I broke my headset jack because the arm of the TV is pushing on the jack & now it's broken. I will try to take another seat another time! No room for under seat storage. This seat has a seat support in the middle of the foot space. This plane did have a foot rest - for those who are shorter. In general, all the economy seats are terrible. Size and spacing is more like a charter flight. Only good thing is overhead locker space is better than normal. We found the pair of seats at the back of the plane (such as 51A/B and 51K/L)to be very comfortable, and worth the extra $32/seat charge. Overall the flight was very good, with decent seat legroom, good video entertainment, plenty of good food, and free drinks. The seats were fine, roomy, and there was plenty of overhead space. The only problem was the foot room. This was made most uncomfortable by two factors: the pedal-like footrests that were in the way, and the metal strut supporting the seat in front of mine. The bar divides your space in two leaving neither adequate room for your shoes or to stretch your legs and rest your feet. Very odd design element. Not much of a recline on the seat, but the lower leg rest was comfortable. Very noisy cabin, could barely hear announcements unless you were wearing the bulky headsets. Inseat-entertainment in row 1 is smaller than in other rows due to the storage in armrest. Entertainment system cannot be used during take-off and landing. No dedicated storage for seat 1G in overhead bin. I cannot recommend this seat. My husband and I were on this plane from ATL-CDG. I agree the 2-3-2 configuration isn't a good one and the cabin was quite noisy. No wonder AF is upgrading all of these planes. I won't fly this model again unless it's been updated. Flying in business class in a 3 class configuration. I seriously don't care for the 2-3-2 configuration. The seats don't lie flat, there is no really convenient stowage; the amenities kit is a joke (a bag; slippers and socks.) The lack of lie flat bothers me the most. I also do not look forward to letting the person next to me in and out as I try and sleep. Very disappointing. Even Delta's business class cabins are better than this. Curtain separating Premium Economy from Business brushes on passenger´s leg. The screen of the On-Demand TV, when stowed, acts as a heater for this seat. Because the tray tables are tucked into the armrests, the seats seem to be narrower than the other standard seats. There is extra legroom but narrow. Added to my original comment...the cabin servive in premium economy is definitley coach. Mo pre departure drink, no ammenities kit and no attention from FA's. Bottom line better seat, hardly "premuim" economy. I take a measuring tape with me on flights, and found 31H was 33" (tip of armrest to tip of armrest) of pitch and 17" wide (in between armrests). Inboard and outboard seats appeared to be aligned, therefore I'd say they were all 33" (not 32" as AF claims), until the back of the cabin where the fuselage squeezes. Then things fall apart for the outboard seats (inboard seemed OK). Am taking this flight tonight again and will measure 38H for you. Flying MIA - CDG for a night flight of about 8 hours. I choose Biz instead of Prem Eco in order to have some sleep. I got some sleep. Seat is good, confortable and with enough spare room for personal belongings. Very good meal (dinner when leaving, breakfast one hour before arriving) and drinks. Attentive service. AF needs however to upgrade those 2-3-2 configuration that is outdated compared to other companies. Not enough bathrooms for the biz cabin. Good VOD screen and video choice, but old system. Price is high, but worth if you do not want to suffer from backpain during two full days after arrival. If you have some flexible departure dates, please check, price variations are really high from one day to the next (in my case Prem eco CDG - MIA and Biz MIA - CDG: 4400  when leaving on Saturday, 2400  when leaving on the next Monday). For this latter price, it was definitively worth. Flying CDG - MIA in this class, abour 9 hours, day flight. This seat is much better than Economy (more legroom, more width) but I would not recommend it to have the possibility to sleep. For relaxing and working yes. Cushion is so hard for such a flight that I put the blanket on it. Meal service 90% similar to Eco. Priority check-in and boarding, what is nice. VOD screen is larger, choice of movies extended, but some doubts if using either the touchscreen (slow) or the remote control (outdated). Question 1: Is it worth 50% price increase (compared to Eco) ? Yes. Is it worth 100% increase? No. At the time of booking for our original dates, price was 2600  return, while 900  in Eco. We delayed our departure dates to find something cheaper. Question 2: When is AF finally considering replacing those *** chushions ? 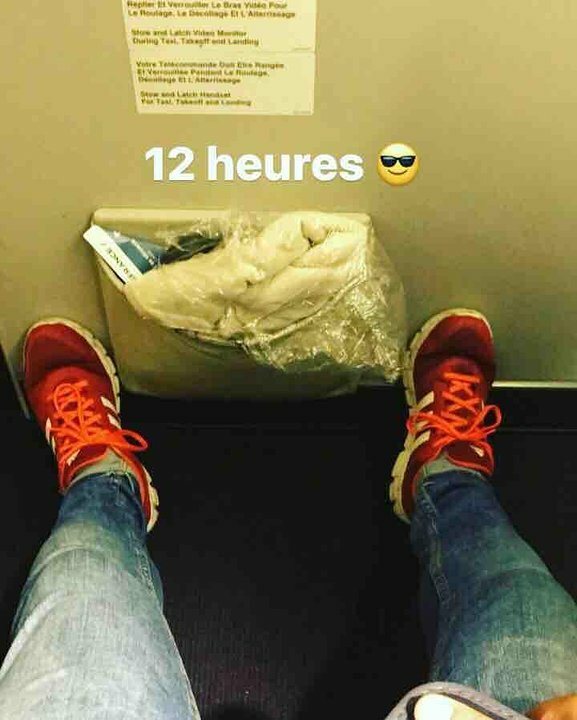 I would not consider those seats for a 12 hours + flight. Seat 50 to 52 A & L only have extra side space due to the cabin curve. On 50 to 52 A & L, there is lot of free space btw the seat and the window panel. Seat 6B on a flight from Rio to Paris. AF lounge in Rio is quite lowly, drinks and food selection can be improved. Departure was ontime. Seat pitch is great, seat itself transformed in flat bed. Service was good, a bit slow but was ok. Food quality was adequate, wide choices of drinks were offered. I managed to sleep 6 hours during the 10,5h flight. Breakfast was served 1h 50 min before landing. Number of lavatories was insufficient, some queues were appeared in the morning. Landed 10 min ahead of schedule. Overall it was good experience. Bulkhead seat. Lots of legroom. Fairly comfortable. Back of seat needs lumbar support. Accessible to toilet in Business requires going through the galley which can be busy at times and only one toilet nearby. Good seat. This seat in premium economy is not a great seat. The seat is to short, so you have bad support for your legs. It feels strange in its schell thats sourround the seat. Hard to find a good relaxing bodyposition. The headphones core is to short, so if you look out the window while you have them on, you will be strangled. Good view over the massive engine. bulkhead row provides enough foot space, but end seat has been modified with table and monitor in the armrests, taking space away from seat. if your body is average (US dress size 14) you won't fit in the seat. I'm a 10-12 and it was if my hips were in a vice. fortunately, cabin crew was able to find me another, average-sized seat. IMO some of the best seats you can get in economy on this plane. Both seats are shifted only about 20cm to the middle of the plane, so 50K has lots of space on the isle side and also 50L has about 10cm free space towards the window. You gain additional storage space for small things you need during the flight from the back of the third seat in front of you. The entertainment system offers an USB port (I think this applies to all economy seats) which supplies enough power to charge an iPhone or similar (but not an iPad) during flight. The AF Premium Economy seats do not recline. THey have gone for the fixed back type that "slumps" instead. I find these really unconformtable for 13+ hours. ALso since the seat bottom cushion moves forwards, part of the point of extra knee room is lost. I can only imagine that the designers of these seats either have never flow for more than a few hours or are about 5' tall. Also the bulkhead seats in row 14 are very awkward to use a laptop at because the armrest-folding table is too narrow (front to back) and too close to the body. All the more so if you slump the seat. Rows 15 and 16 are better for laptop use but have the same comfort issue.